Dated 1863 with late 19th century additions. Asymmetrical double pile 2-storey, 4-bay, rectangular-plan villa with imposing conservatory and Edwardian Baroque entrance porch to principal (S) elevation. Good detailing to house, interesting collection of ancillary buildings and garden features sitting within impressive grounds. It is recognised as the best villa in the Leny Feus development. The rear (N) block formerly the servants wing has been sympathetically converted to a separate dwelling known as Robertson House. The principal S elevation is dominated by a large 7-light conservatory added in the late 19th century to the left of the porch. Plainly decorated with canted sides and a simple corniced flat roof, its large windows are divided by stone mullions with oculus vents set below. The prominent central 2-storey entrance tower was altered in the late 19th century to incorporate a high quality entrance porch. The porch consists of a round arched opening with an architraved arch-head flanked by ornate consoles supporting a heavily corniced open pediment embracing a coat of arms flanked by reliefs. The interior of the porch has a stone bench to the right with a pulvinated and incised back, the ceiling is plaster groin vaulted. A 2-storey, 3-light canted window bay is arranged to the right, corbelled out to the gablehead and containing a decorative datestone. To the garden (W) elevation are 2 wide gabled bays. A 3-light box window lights the ground floor dining room. A 2-storey, 3-light canted window to slightly advanced right bay. A 2-storey dormered former servants' wing is recessed to the left with an altered single-storey gabled arm projecting out to the left. The rear (N) elevation is the plainest elevation as it primarily housed the servants' accommodation. The wide gable to the left is blank with a single storey 3-bay range extending to the right. The central (former servants') it is now the principal entrance to Robertson House. It has a breaking eaves stone gablet flanked by small narrow windows. The E elevation is relatively plain with the regularly-fenestrated 2-storey 3-bay dormered former servants' wing to the right. There is a wide gabled bay to the off-centre left with bipartite windows to ground and 1st floor. This part of the house has also been given over to Robertson House and is therefore internally separated from the main house. The left is blank apart from a tall round-arched stair window. Encaustic-tiled decorative floor to entrance/stair hall. Round-arched fossiliferous-limestone chimneypiece with engaged barley-sugar columns to hallway, the owner informed that she believed the mantelpiece and grate to be purely ornamental with no flue. Varnished pine timber dogleg stair with barley-sugar newel and turned balusters. 4-panel doors with classical overdoors to principal rooms, restrained folaceous and strapwork plaster decoration and cornices. Timber panelled shutters throughout. Stugged, squared and snecked 'pudding stone' rubble with blond sandstone ashlar dressings, polished ashlar dressings to later entrance porch and conservatory. Six panelled main door with plate glass round-arched fanlight. Predominantly 4-pane timber sash and case windows to principal elevations, mainly 6-pane to conservatory, and 8-pane to rear elevation, multi-paned stair window with stained glass depicting thistles to border-glazing. Grey slate roofs, plain timber bargeboards to gables, overhanging eaves with exposed rafter-ends. Tall tripartite wallhead stack to S elevation with panelled base, stop-chamfered shafts and corniced copes, circular clay cans. L-plan single storey and attic lodge house with the entrance set in a single-storey link to the SE. The stone entrance porch and link supports a quirky roof-top walkway with an attractive decorative wrought iron balustrade providing 1st floor access from the stable block to the lodge. (The owner attributes this arrangement to a former lodge keeper's numerous offspring as further living accommodation was formed in part of the stables). To the right of the entrance is a single storey canted window centering the advanced gable with a window centred above. The NE street elevation is dominated by a wide gable to the left with a bipartite window arranged to the ground floor and a window centred above, to the right is a slightly recessed regularly-fenestrated dormered bay. Internally the lodge is simply organised with 2 rooms to the ground floor and 2 rooms to the 1st floor. Snecked stugged rubble 'pudding stone' with sandstone dressings. Grey slate roof with plain timber bargeboards to gables and exposed rafter-ends at eaves, large centred corniced stack with circular clay cans. Single storey and loft rectangular-plan former stable and coach house with single storey link to the lodge at the N end. A breaking eaves loft door gives access to the roof-top walkway to the NE. The NW elevation faces the enclosed stable yard with a large 20th century opening with a sliding timber door to the ground floor. Piended dormer window breaking eaves above opening to ground floor, probably added when part of the stable was converted to living accommodation. There is a stone pen-check stair with wrought iron handrail to the outer left giving access to the roof-top walkway. The SE elevation is predominantly plain with a timber mullioned window to the right bay, there are timber-louvered ventilation openings below the eaves to each bay. Random rubble 'pudding stone' with smeared pointing, sandstone dressings. Grey slate piended roof with exposed rafter-ends at eaves. Set of matching gatepiers to E of Lodge, each with bases, panelled shafts and boldly corniced caps, linked by dwarf wall which extends along Leny Feus to the E (originally with railings, these no longer exist, 2004). Coped rubble boundary wall swept down (W of lodge) to capped ashlar gatepiers and 2-leaf timber gate accessing former stable yard. High random rubble boundary walls to perimeter of garden to E and W, running S. Low rubble wall to S running along Leny Road. The house is set within its original plot consisting of extensively landscaped and planted grounds running to 4 acres. A canalised burn runs past the lodge and stable block with a simple timber board bridge giving pedestrian access to the lodge. The burn passes over a cascade and into a pool to the W of the house, an underground channel takes it some distance further before it emerges to the far SW of the garden running close to the S boundary wall. A kitchen garden is situated to the W of the stable yard with a plain 5-bay mono-pitch timber greenhouse built against the wall extending W from the lodge. A grotto built from a circular-plan stone rubble retaining wall with earth banked behind it is situated to the SW of the garden, an entrance is cut into one of its sides with ferns and ivy heavily planted around. 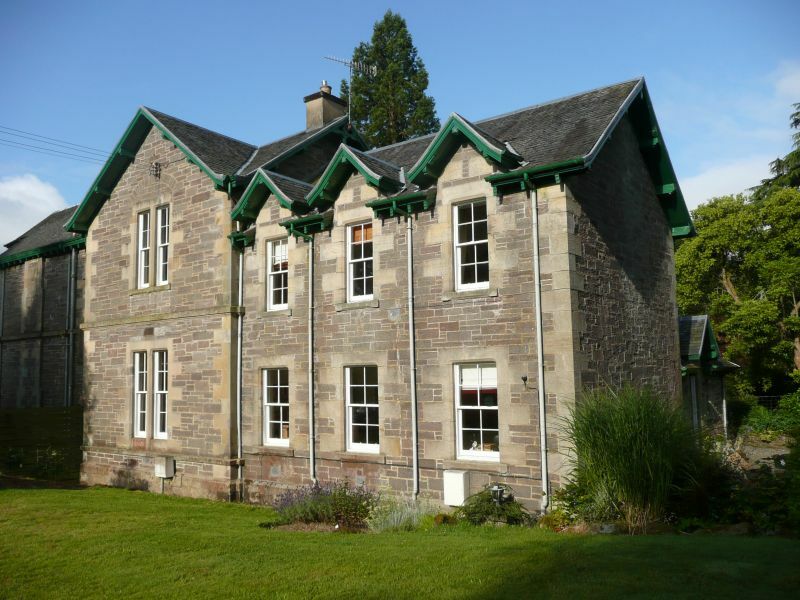 The house is situated in Leny Feus, an area developed in response to the arrival of the railway in Callander. Many of the houses in this area were built to offer accommodation to wealthy tourists who spent the summer months residing in Callander. Callander Lodge however, is different, being expressly built for Colonel Robertson as his main residence. Colonel Robertson was a well respected figure within Callander during the mid/late 19th. He had a very successful army career in India and retired to Callander. The present owner credits the landscaping of the grounds to Colonel Robertson who is known to have had a passionate interest in horticulture. The plot that Callander Lodge sits in is twice the size of the other plots to Leny Feus as it is said that Robertson wanted to secure a large garden that he could develop and stock with plants.